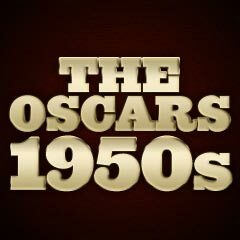 Marking the decline of the old Hollywood studio system, this was the first year in which the Best Picture Oscar was given to the film's producers rather than to the studio that released the film. 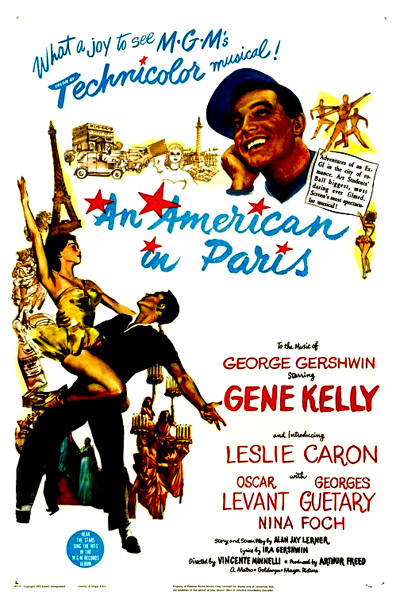 Director Vincente Minnelli's An American in Paris, a lavish, Technicolor, Gershwin-scored musical, was a major surprise winner of the Best Picture Award in 1951. (The Arthur Freed-produced film with eight nominations won a total of six Oscars including Best Picture, Best Story and Screenplay - Alan Jay Lerner, Best Color Cinematography, Best Color Art Direction, Best Color Costume Design, and Best Score for a Musical Picture. In addition, it was presented with the Thalberg Award for producer Arthur Freed, and an Honorary Oscar was presented to virtuoso Gene Kelly. The film was about an ex-GI painter who remained in Paris following the war, and became enmeshed in a romantic triangle between a rich American patroness (Nina Foch) and a lovely 19 year-old French dancer (Leslie Caron). It was the first musical to win the Best Picture award since The Great Ziegfeld (1936) and Broadway Melody (1928-9), the first color film to win an Oscar since Gone With The Wind (1939), and one of only a few Best Picture winners that received no acting nominations. The remaining nominees included the most expensive film of its time - MGM's big budget epic version of Henryk Siekiewicz's classic novel and director Mervyn LeRoy's film Quo Vadis (with a total of eight nominations and no wins) about Nero's Christian persecution and starring Deborah Kerr and Robert Taylor, and 20th Century Fox's and director Anatole Litvak's WWII thriller Decision Before Dawn (with a weak total of two nominations and no wins). Quo Vadis had the dubious distinction of not winning in any of the categories in which it was nominated. It was thought that the two front-runners Streetcar and A Place in the Sun split the vote, thereby handing the victory to the MGM musical. Twenty-seven year-old front-runner Marlon Brando (with his first of eight career nominations) was competing for Best Actor for his second film performance (he had debuted a year earlier in The Men) as the animalistically-brutish, abusive Stanley Kowalski (Kim Hunter's wife and Vivien Leigh's brother-in-law). Method actor Brando lost the hotly-contested contest to long-deserving Humphrey Bogart (with his second of three career nominations - and his sole career Oscar win) for his role as gin-loving, earthy skipper Charlie Allnut in director John Huston's The African Queen (with four nominations and one win - Bogart's Best Actor honor). Many interpreted Bogart's win as a payback award, and as a "career" Oscar (since he had been passed over for major film nominations or wins - including his many un-nominated roles in The Maltese Falcon (1941), To Have and Have Not (1944), The Big Sleep (1946), and The Treasure of the Sierra Madre (1948)). [Bogart's first nomination was for Casablanca (1943), and he would be nominated one more time for playing paranoid Captain Queeg in The Caine Mutiny (1954). Interestingly, Brando and Bogart were both nominated again in 1954, but this time, Brando won the Oscar for On the Waterfront (1954).] Bogart's win in 1951 was an upset, since it denied the predicted clean-sweep for the cast of A Streetcar Named Desire, and a much-deserved Oscar for Brando. The other nominees were: Eleanor Parker (with her second consecutive nomination out of a career total of three unsuccessful nominations) as Mary McLeod (detective Kirk Douglas' wife with a secret past) in Detective Story, Shelley Winters (with her first of four career nominations) as pregnant factory worker Alice Tripp in A Place in the Sun, and past Oscar-winner Jane Wyman (with her third of four career nominations) as self-sacrificing nanny-nursemaid Louise in director Curtis Bernhardt's The Blue Veil (with two nominations and no wins). The Best Foreign picture (receiving an Honorary Award) was director Akira Kurosawa's Rashomon - it was also the first post-war Japanese film to be shown widely in the West and to attract attention, and it made Kurosawa's favorite actor, Toshiro Mifune, a world famous star. Virtuoso dancer, film actor, singer, director and choreographer Gene Kelly received an Honorary Academy Award "in appreciation of his versatility as an actor, singer, director and dancer, and specifically for his brilliant achievements in the art of choreography on film." Decision Before Dawn was a minor film (and nominated for only two Oscars), but since it was supported by Fox studio head Darryl F. Zanuck, it appeared on the Best Picture ballot. A number of films should have been nominated for Best Picture in its place, but weren't. Independent studio United Artists couldn't muster enough support to get its popular and entertaining classic film The African Queen nominated for Best Picture, although their strong film candidate was nominated for Best Director (John Huston), Best Actor (Humphrey Bogart), Best Actress (Katharine Hepburn), and Best Screenplay (James Agee and John Huston). Christian Nyby's and the Howard Hawks'-produced The Thing was completely un-nominated. Director Alfred Hitchcock's and Warner Bros.' superb psychological suspense thriller Strangers on a Train went un-nominated in all categories except Best Black and White Cinematography. Robert Walker was snubbed for his great performance as gay, psycho-pathic killer Bruno Antony, who murdered tennis pro Guy Haines' (Farley Granger) estranged wife Miriam and then demanded, through blackmail, the reciprocal murder of his own tyrannical father. One of the finest science-fiction films of all time, Robert Wise's The Day the Earth Stood Still, missed out on the nominations - although its message of peace brought by an interplanetary traveller named Klaatu (Michael Rennie) was a welcome relief.